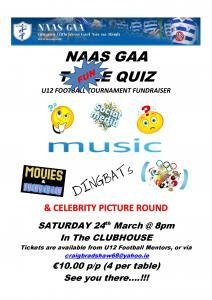 Our U12 Football mentors are holding a table quiz in the Club on Saturday 24th March at 8pm, to raise funds for the annual Naas GAA U12 Football Tournament. Why not get a team of 4 together or just come along and join a team, all are very welcome. €10 per person (4 per table).